The University of Michigan will receive a $4.3 million gift that will, in part, help to support an education partnership involving schools in West Michigan. 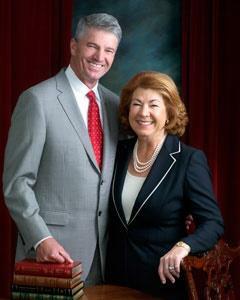 The gift announced this week from Grand Rapids business and community leaders Mike and Sue Jandernoa will benefit the School of Education's TeachingWorks organization, establish a needs-based scholarship at the Stephen M. Ross School of Business, and expand Gerald R. Ford School of Public Policy fellowships. The majority of the gift — $3 million — will be used to expand a TeachingWorks partnership in Grand Rapids focused on preparing and coaching teachers, and emphasizing math readiness among West Michigan children. "The Jandernoas' leadership is remarkable because their gift is accompanied by a generous personal commitment to build the partnerships that will benefit children in this state" said School of Education Dean Elizabeth Birr Moje in a statement. Another $1 million will establish the Mike and Sue Jandernoa Scholarship Fund for the Ross School of Business, where Mike received his bachelor of business administration degree. Sue Jandernoa is a former educator of 30 years. Mike Jandernoa is a 1972 University of Michigan graduate. He's a former chairman and CEO of drugmaker Perrigo.